More than 100 parent leaders with Logan Square Neighborhood Association convened at Funston Elementary Friday morning to make the declaration. 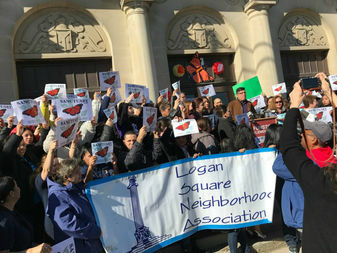 LOGAN SQUARE — More than 100 parent leaders with Logan Square Neighborhood Association convened at Funston Elementary Friday morning to spread a simple message: Our schools will be "sanctuary zones" for immigrant students and their families. “Right now I see students holding themselves back more. Eyes open, guard up,” said Hilda Arias, who runs afterschool programs for the neighborhood group, in a prepared statement. In light of Trump administration policies that have infuriated immigration groups, the influential neighborhood group is doubling down on efforts to protect immigrants. The group is partnering with neighborhood schools on "Know Your Rights" immigration law workshops and emergency action plans to ensure every school staff member knows where to go with immigration-related questions. Ald. Roberto Maldonado (26th) and Ald. Carlos Ramirez-Rosa (35th) attended the press conference, which was held at Funston, 2010 N. Central Park Ave. Ramirez-Rosa has also pledged to protect immigrants in his ward and continues to push Mayor Rahm Emanuel to extend protection at the city level. 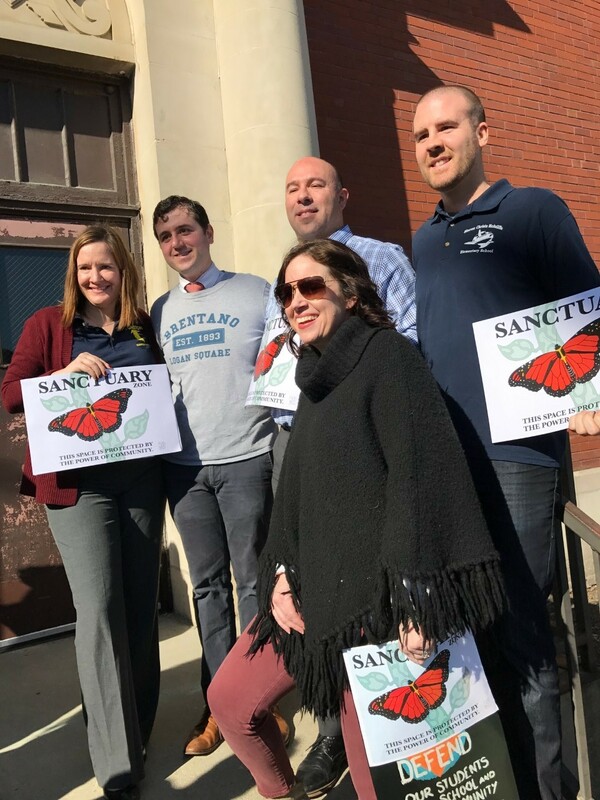 At the event, the parent leaders debuted "sanctuary zone" signs, which they are planning to hang at school entrances throughout the neighborhood. The signs, which have a monarch butterfly design, read: "This space is protected by the power of the community." By declaring schools "sanctuary zones," the group is trying to nurture hope in a political climate that is "taking a a devastating mental and emotional toll on students and parents." “I feel protected by the power of community,” said parent leader Monica Espinoza. “Maybe we don’t have peace of mind, but we have hope and we can pass that hope along. I want to stop surviving. I want to live a free life. Starting with ourselves and our schools, we can change the world." The district said it doesn't allow immigration and customs enforcement officials into schools unless there is a verified criminal warrant or court order. Back in December, the Chicago Board of Education passed a resolution, declaring CPS as welcoming for all students, meaning the district does not require students to disclose information about their citizenship or immigration status. "Many members of our school community are deeply concerned about recent federal activity," said Michael Passman, a spokesman for CPS, in a prepared statement. "We want our families to know that we will do everything legally possible to prevent ICE from accessing our schools. We continue to seek out opportunities to better support our students and families, and we will be providing additional resources and supports in the coming days to help address their concerns."